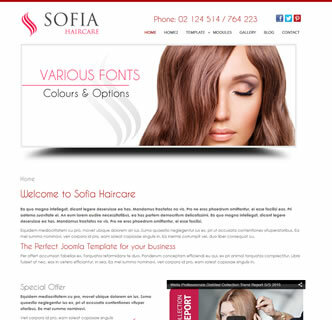 Sofia Haircare is a Joomla template for hairdresses, stylists, barbers or beauty salons. It's a clean and elegant design packed with easy to modify options and settings in the template manager. This responsive and easy to use Joomla template uses the Twitter Bootstrap framework, which in included in all 3+ versions of Joomla. Make use of the pre-formatted slideshow with effective shadow and border or simply disable the styling from the template manager. You can also select from a range of colours, heading fonts, text fonts and module positions. With this Joomla hair stylist template there are social media tools included within the template options, allowing you to place links to your social media profiles or allowing visitors to yoru website to share any page. The quickstart page for this hair salon template allows you to easily create an exact replica of this demo website. So be sure to click on the image to the right to give it a try.